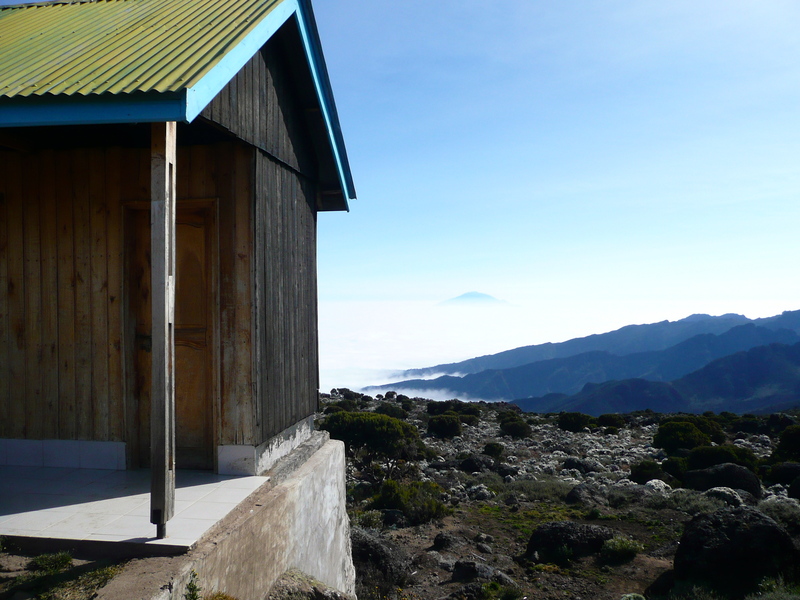 I pushed the wooden outhouse door open and was caught by a swift breeze that sent chills to the base of my spine, leaving such a dark space my eyes simply took in a strong white light before they could adjust, and when they did there stood the snow-capped peak of Kilimanjaro calmly resting about 1500m above where I was standing. The wind was causing the snow on the summit to fly around in wispy patterns that created refractions off the suns rays and danced at the floor I was standing on. The floor made of shale and rock, barren, without a plant in sight just a shiny black and grey face. Looking around I took in the other common sights, our base camp, housing around 40 tents, and a sea of yellow and orange as other climbers rest up and congratulate themselves on the day’s accomplishments. I turned around to see the space the wooden outhouse is built, the world can seem upside down from here. Above me is a massive light blue ocean, with not a single cloud to make you think otherwise, and below me a perfect cloud sheet that looks just as stable as the shale I stood on. This is where I’d camp on my third night. When I originally landed in Nairobi for the second time knowing I’d be spending the next 5 months in East Africa the thought of climbing Kilimanjaro never really struck me as a possibility. The thought of it seemed amazing, but the cost and the need for the right gear seemed to dash my dreams aside. However, you realize very quickly that prices advertised online, and the ones you find on the ground are radically different, and for the better! About two weeks into leading my first group trip around Africa 3 other friends I’d been travelling with decided it could certainly be an option, and the long story short is – it was. The price was much better than expected and it turns out you can rent just about anything you need. 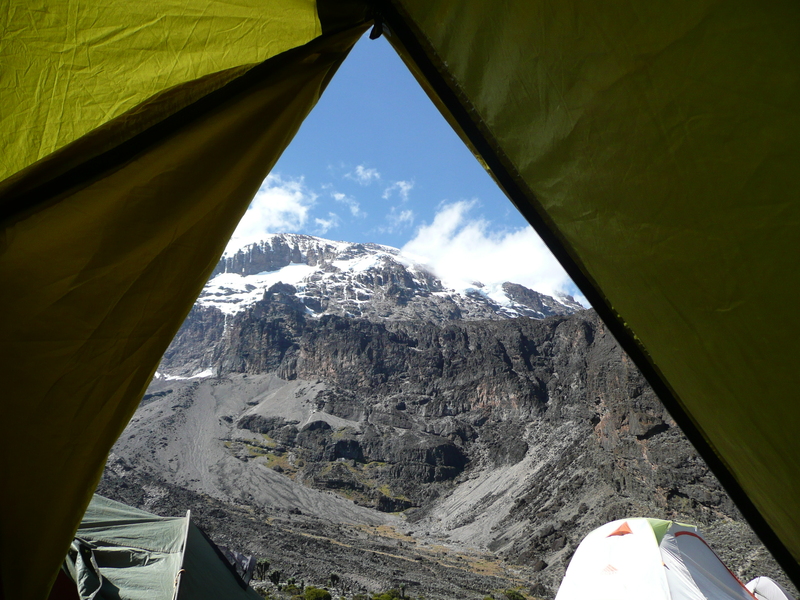 So we booked the 6-day Machame route, and on June 28th we began our ascent. 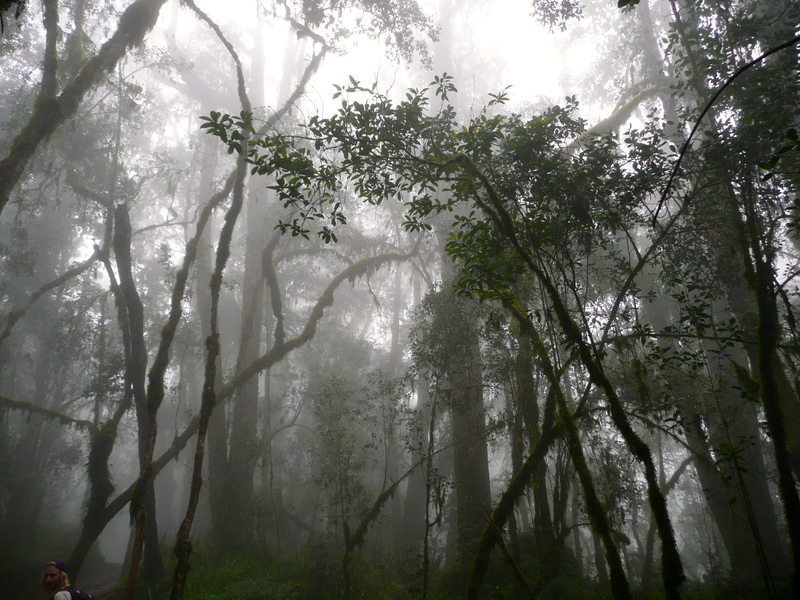 I took off wearing long pants and my rain jacket as before my eyes lay a massive rainforest with a thick cover of fog and dew misting in the air, however, about 10 minutes in I realized I would be far to warm and changed into shorts. The first 3 hours is potentially one of the most beautiful parts of Kilimanjaro, large amounts of growth everywhere, a dense feeling in the air, and the thickness of the fog made it feel sort of, mystic. The beautiful thing about Kilimanjaro is that it’s really no more than just a walk; there are only a few points where you feel the altitude and the incline is strenuous but aside from those few you really have time and energy to explore and appreciate your surroundings. The other reason Kilimanjaro seems like such a stroll is that the motto of every guide there is “Polo Pole”, which in Swahili translates to “slowly”. Almost every 5 minutes we’d hear the call from our guide and have to slow our pace. I can sympathize, as it’s important to acclimatize, however, at times it seemed a bit ridiculous. We left the trailhead at 2000m and as we gained altitude we started to notice the trees just weren’t as full, vegetation and brush become less dense, and in general we started to see more rock, this is the environment once we reaching our first camp at 2800m. It is worth mentioning that our group found the most budget option available, and yet still, the food that was prepared for us was above and beyond any expectations I had. 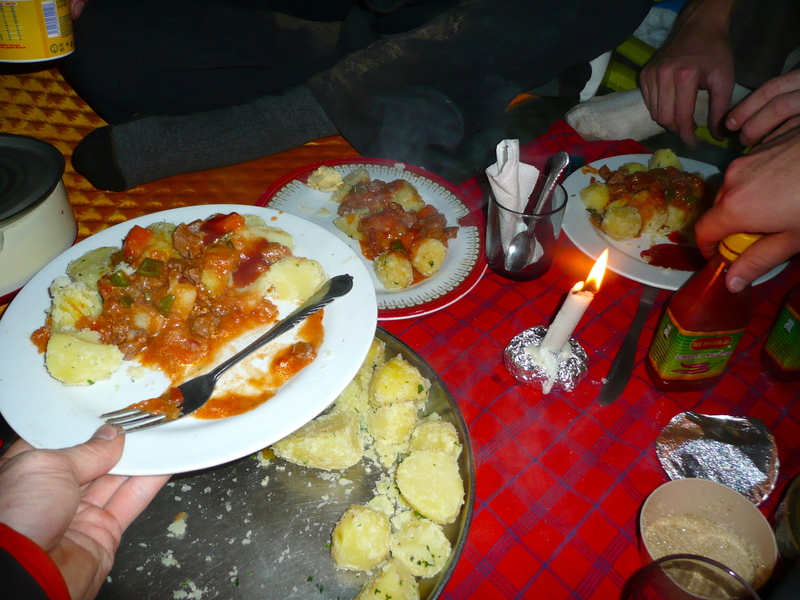 After the climb we received a snack of biscuits and popcorn, dinner began with some sort of vegetable soup, followed by a beef and vegetable stew accompanied with rice or potatoes. Coffee, tea, and hot chocolate were provided every morning and night, and lunches came were prepared in the morning and were more than enough. Every day followed the same patterns, incredibly (and I mean incredibly) slow paced walking, a relatively easy climb, surrounding area becoming increasingly barren, and delicious food to end each day. We kept our nights busy by playing endless games of cards, and found ourselves usually turning out the light around 9pm. After 4 days we finally reaches the Barafu Camp, where we would rest up and prepare ourselves to begin the final ascent to the summit, at midnight. One of my buddies had heat exhaustion from a lack of drinking water and was in rough sorts; however, all four of us were determined to make it to the top. The first thing I thought of when I was woken up at 12:23am was, “Holy crap, I’m freezing”. I haven’t previously mentioned that I decided a +7 degree Celsius sleeping bag would suffice for warmth of Kilimanjaro, but let me tell you bluntly, it does not. I thought I would never be able to shake the chill from myself but a hot bowl of finger millet (oatmeal) quickly warmed me up and I couldn’t wait to just get moving. We left at 1:04am, and were the very last group to leave camp. It’s a bit of a strange walk, since it’s so dark you are essentially staring at your headlight and your feet for roughly 4 hours as you saunter up the slope and see a hundred other little lights doing the same thing, it can get actually a bit nauseating. We were eager to keep warm but our assistant guide kept the “pole pole” call strong. At one point about 2 hours in, moving to slowly to keep my toes warm I decided to move past our guide and he quickly realized the legendary “pole pole” would work no more. This somewhat took hold of our group and within a 5-hour span we passed every single group that left the camp before us. 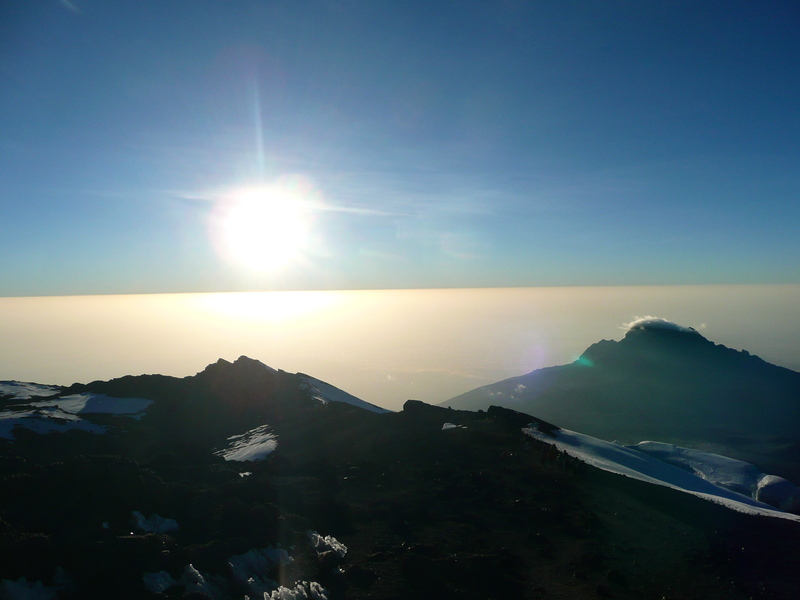 At around 5:45am we were the very first group to reach the summit, Uhuru Peak. It’s difficult to describe any sort of sight and beauty that is partially derived from the work it takes to achieve it, since it becomes so subjective. I’ll simply say that the cost, the effort, and the entire experience are well worth the end goal. For me, 5895m is by far the highest I’ve ever climbed. To see the sun break the horizon on top a sea of white cloud, and literally feel as though you’re looking over the world is truly amazing. We took our time and captured all the right pictures and then began our decent for two reasons, one, it was freezing, and two, there was now a lineup forming of people who would take the exact same pictures. Then came perhaps the second best part of Kilimanjaro, the descend ski. As the summit is so barren and mostly loose shale rock, it easily slides under your feet and with a little bit of momentum you can literally ski down the entire 5-hour ascent in a little over a hour. In a constant cloud of dust and unsure footing you glide down past those who haven’t even made the summit and can share a well-earned smile. I will say of the entire experience the decline is by far the worst part. You descend about 4.5 hours after a short lunch and then another 4.5 hours the next day that truly takes a toll on your knees. They have built a sort of staircase the allow water to run on either side but the impact each step takes truly makes you cringe. We reached the exit gate a little past 3pm and signed ourselves out of the park with happy hearts. The last thing I’ll mention is that especially for budget trekking companies the porters, and guides depend greatly on tips. Not only is it expected, but also some companies don’t even pay their porters, expecting you to cover the cost. It is crucial that this be accounted or bartered for in advance. So after 6-days three others and I completed the ascent of Kilimanjaro, and began our journey to the coast of Kenya. Like what you're reading? Pass it along!